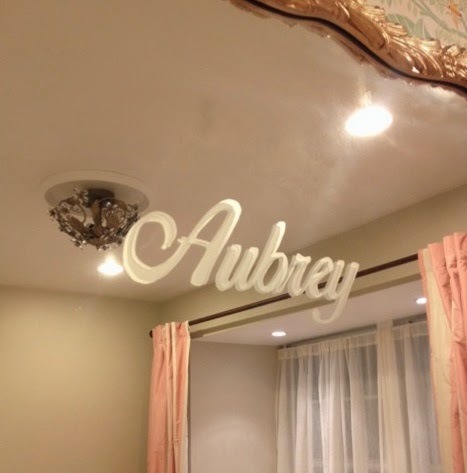 Now that the nursery is finally complete and ready for Aubrey to be here, I wanted to post a breakdown of the nursery details for anyone interested. This nursery was so fun for me to put together. 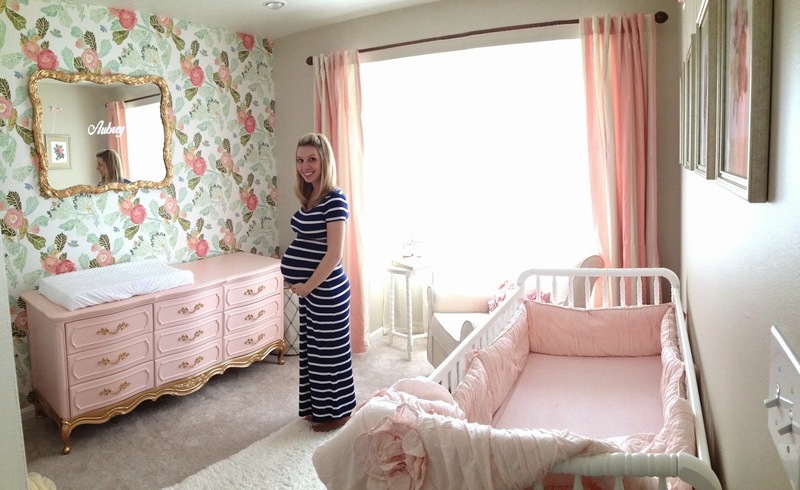 I am so exited for her to be here and to be able to put her to sleep in here! Lamp: Vintage, handed down to me from my mom. It was in my own nursery. Chair Pillow: Homegoods find, fits perfectly! 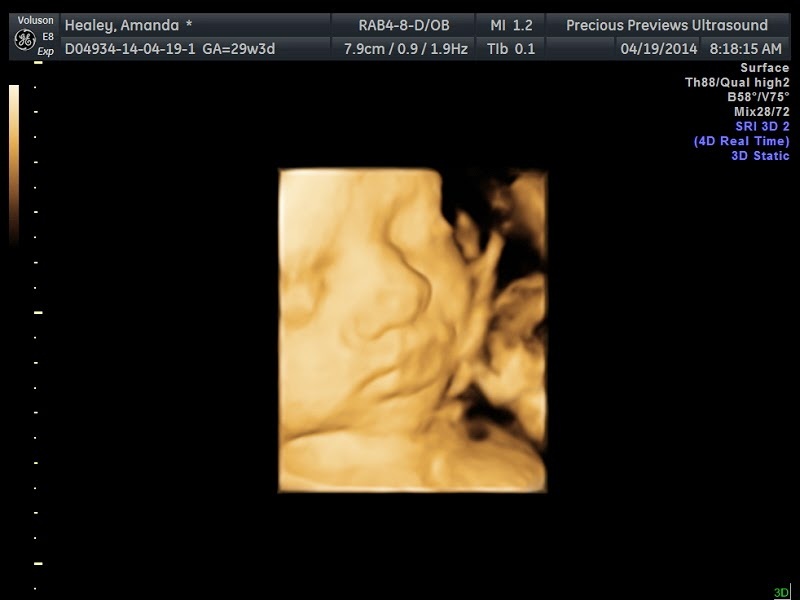 We went this passed Saturday to get a 3D ultrasound of our sweet girl Aubrey. With two grandmoms and a granddad in tow, we all gathered around the flat screen to get a peek. Aubrey had other plans. Not only was it play time, she kept her hands up in front of her face the whole time. The technician tried everything to get her to shift positions, but all were failed attempts. We had a check up ultrasound for our little girl last Thursday. 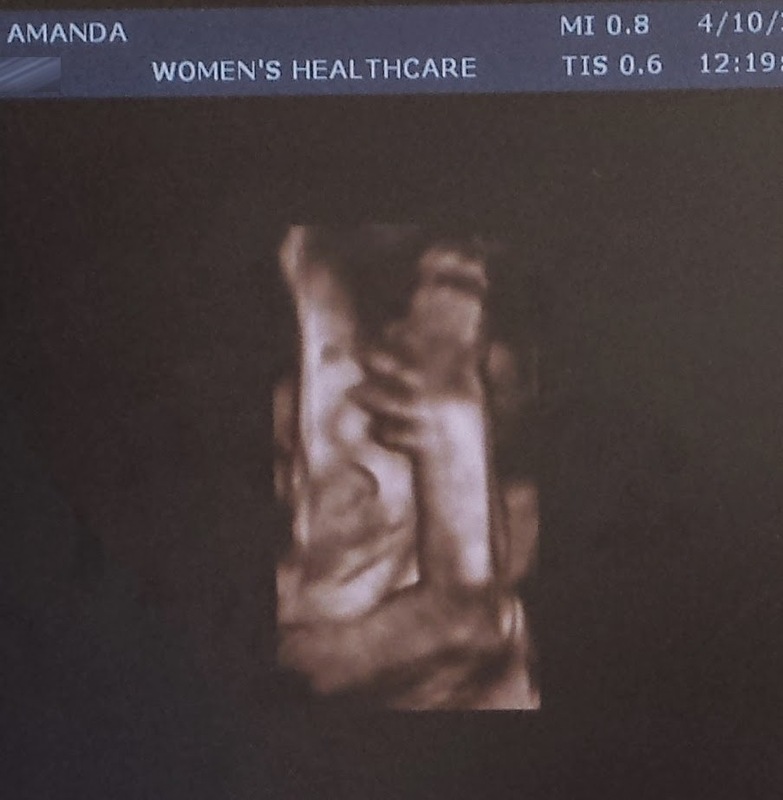 Our doctors office had a (not the best) 3D ultrasound machine. She wouldn't cooperate and they couldn't get a good measurement of her head, so we killed some time peeking at her in 3D! She is truly amazing. I could stare at her all day. After we killed some time with the 3D, she finally moved so we could get her last measurement. She weighed in at 2lbs 11oz. She is in the 58th percentile for weight. She's about 14 inches long. 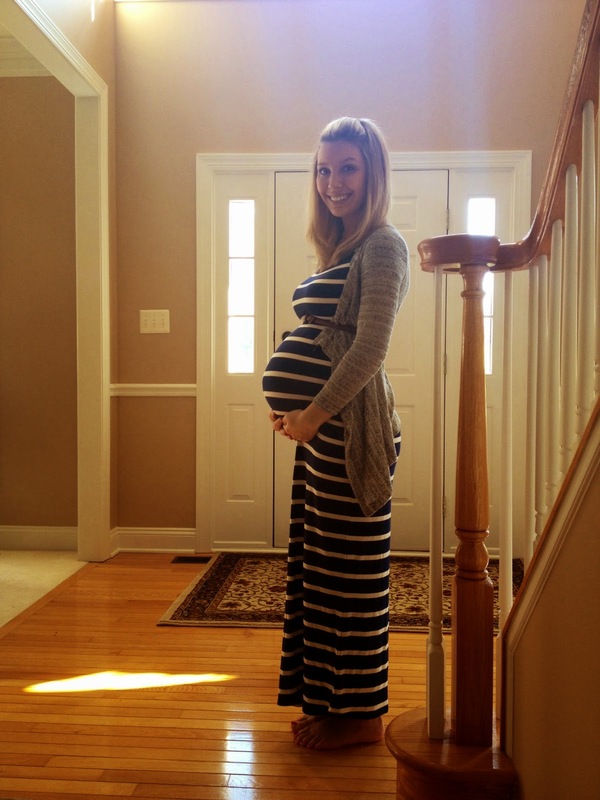 Her smallest measurement was 27 weeks and her largest was 29 weeks (her head!). 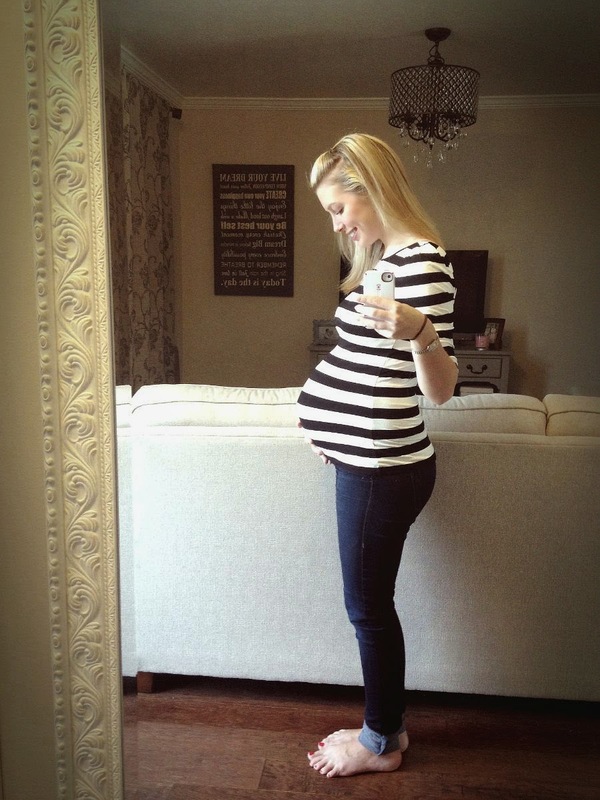 This was great news because she is 28 weeks. Right on track! It was a good day all around. I wanted to post some of my belly growth pictures. 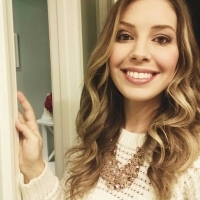 I have been keeping my friend and family updated with Facebook and Instagram, but left out the blog! 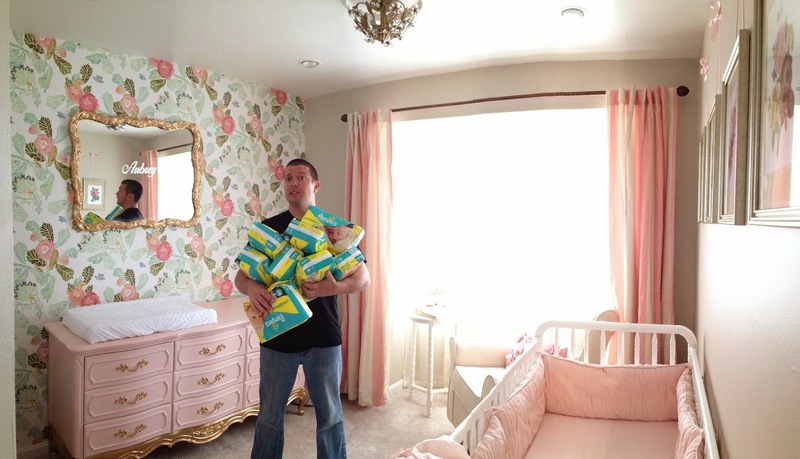 Yesterday my husband and I got to working on the nursery. I am SO glad we did. Everything was worth it! We took down the white ceiling fan and installed a new gold light, put together the rocker chair, decided on which frames to use and put in the prints I made and hung her customized gold mirror. 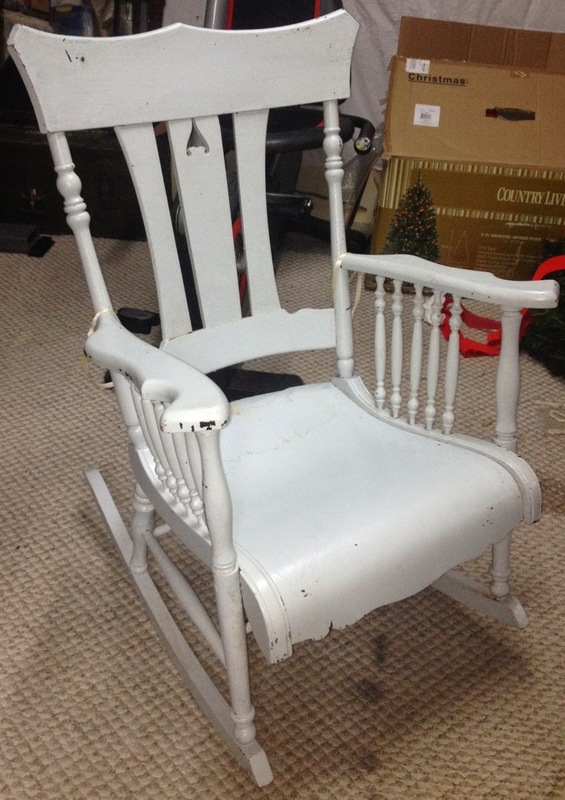 Option #1: Was to use the old rocker that has been handed down from my grandfather. I was rocked in it as a baby, and would have loved to use it to rock my daughter. It would just need a coat of fresh paint and a comfy cushion. The problem? I was pretty set on an upholstered chair of some sort. I would love to be able to fall asleep in the chair if needed. We decided to use this in the nursery at my parents house for when Aubrey visits. 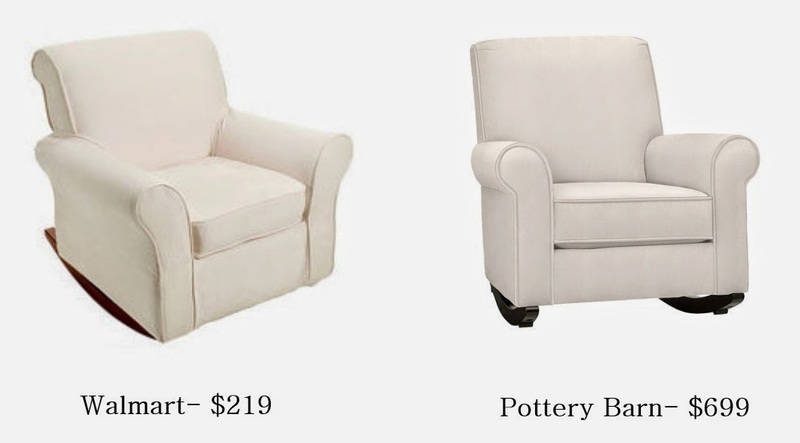 Option #2: To pick any of those BEAUTIFUL upholstered rockers/gliders that you see at Pottery Barn, Restoration Hardware, etc. Except, they are all SO expensive. Most of the ones I like are over $1,000...for a CHAIR! That's a no-can-do for this frugal girl. Option #3: The famous IKEA Erktorp Jennylund chair. 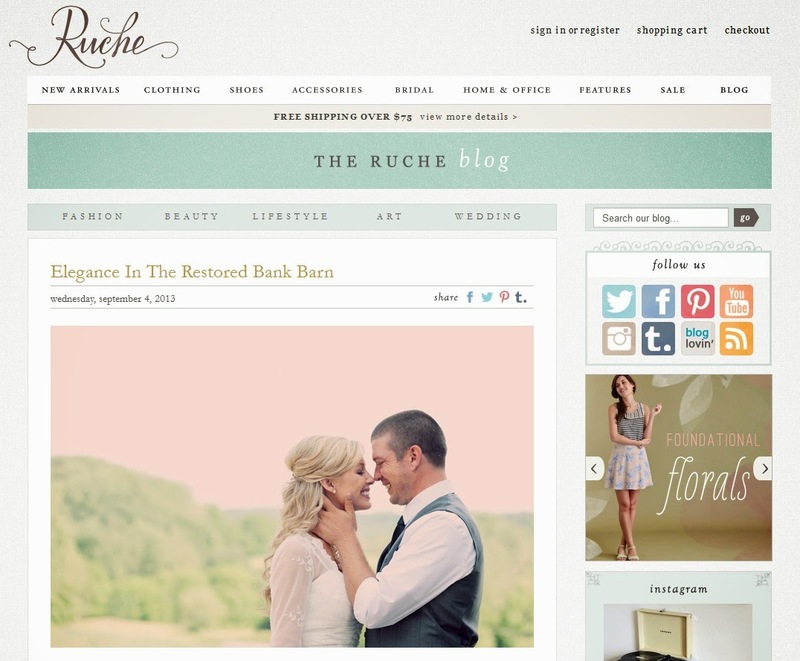 I have seen so many bloggers use this chair and attach a rocker base on it (extra $40). I was pretty sure this was what we were going to use. There were a few days when I was ready to head to IKEA and bring it home. I'm not sure about IKEA's return policy and the closest store is a bit of a drive for me. This is still an open option....but I wanted to try another first. Option #4: I found an upholstered rocker on Walmarts website. They are out of stock most of the time. When they are in stock, they usually only have 1 color available at a time. It had been forever and the only colors I saw become ready were Chocolate and Demin. Not for me. Well, the Beige cover was available today, so I bit the bullet and ordered the chair. It was free shipping and Walmart is GREAT with returns. 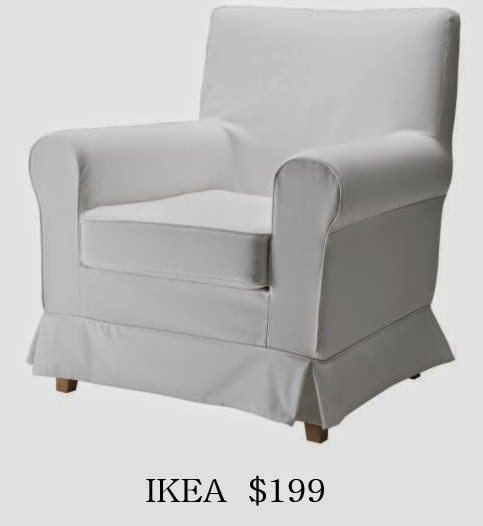 If this chair doesn't work out, I will return and try the IKEA Jennylund route. 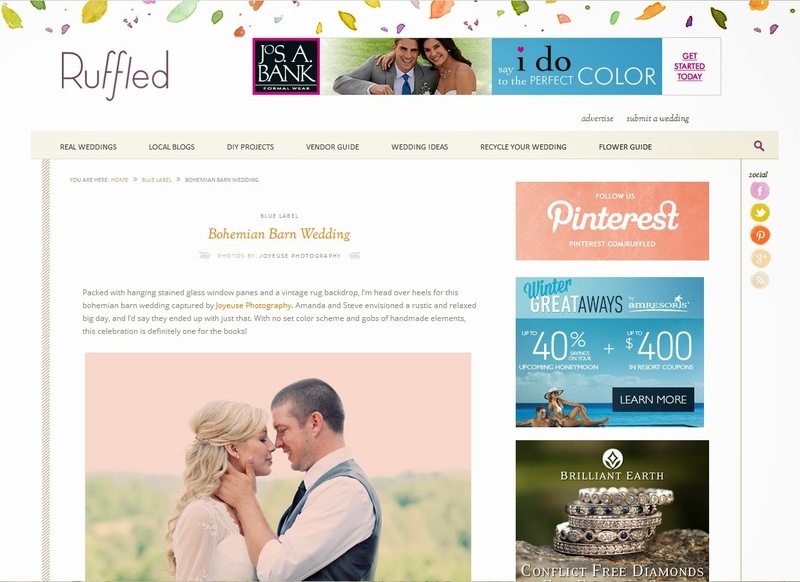 It has been 10 months since our wedding, and we have been so lucky to be featured multiple times. 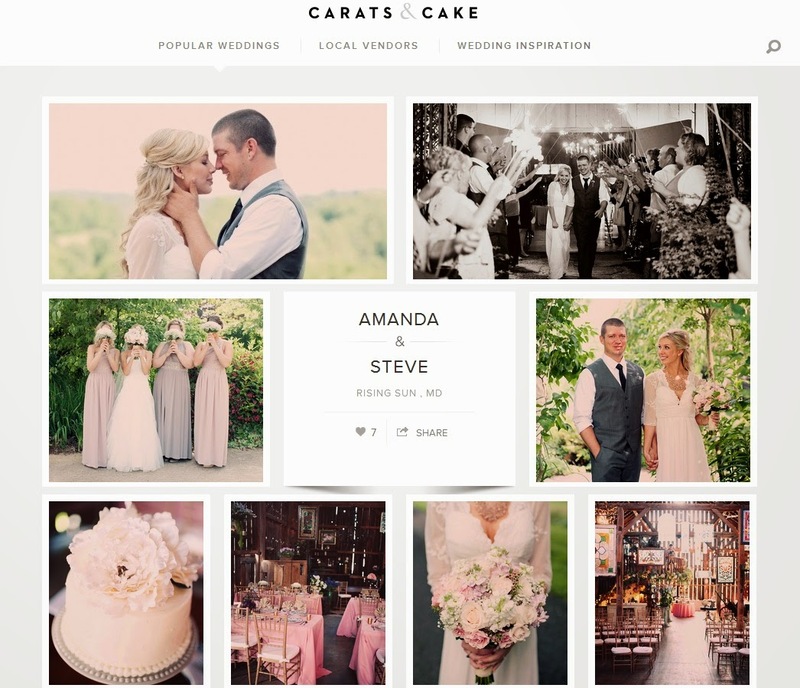 I wanted to share a few of our features. 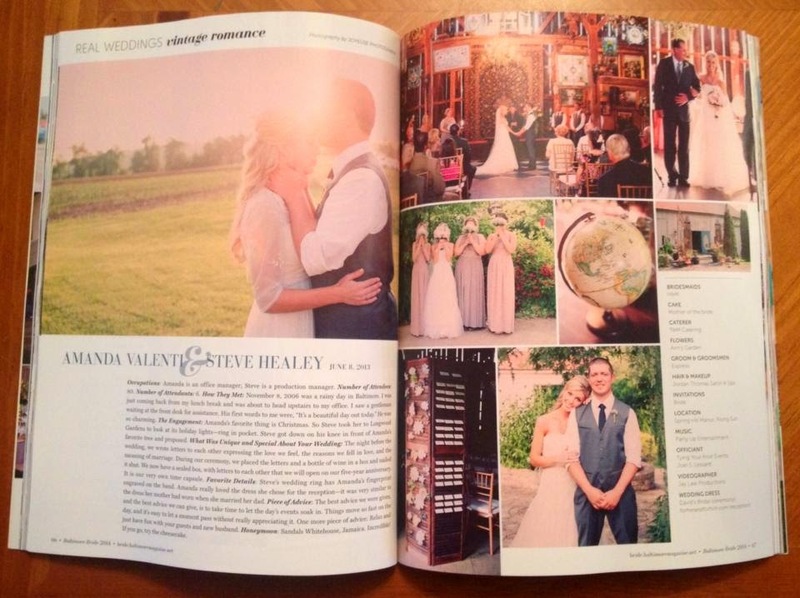 Our absolute favorite is our 2 page spread in our Baltimore Bride Magazine! How cool is this?! Our wedding day was one of the most memorable days of my life. Marrying my best friend and companion of 7 years was the best feeling in the world. Seeing these images brings me back to that wonderful day!